The human tendency to be right-handed is obvious—especially if you’re a lefty, and have to deal with right-handed desks and scissors, not to mention spiral notebooks. But humans aren’t the only members of the animal kingdom that show handedness, or the preference for one hand over the other. Other primates exhibit right-handed or left-handed proclivities, as do animals that don’t technically have hands. For instance, research has shown that some mice are righties while others are southpaws, and that some tree frogs preferentially jump away from predators in one direction over another. Handedness is related to brain asymmetry—that is, differences in function and anatomy between brain hemispheres. Put simply, the left side controls your right hand and vice versa, and your hand preference is predictive of some of the activity that goes on in each half of the brain. Brain asymmetry was once considered unique to humans, but now we know that it’s common in vertebrates. “You see asymmetry going all the way down to fish,” says Claudio Cantalupo, who studies handedness and brain asymmetry in humans and nonhuman primates at Clemson University. Researchers have known for decades that other animals demonstrate handedness. But only recently have they started to learn that, like Homo sapiens, other species can be characteristically handed—meaning that “a statistically significant majority of the individuals in a population prefer one hand to the other,” says Bill Hopkins, who studies lateralization and handedness in primates at Georgia State University. Hopkins offers some examples from his own research: In chimpanzee populations, about 65-70 percent are right-handed. Gorillas are about 75 percent righty. 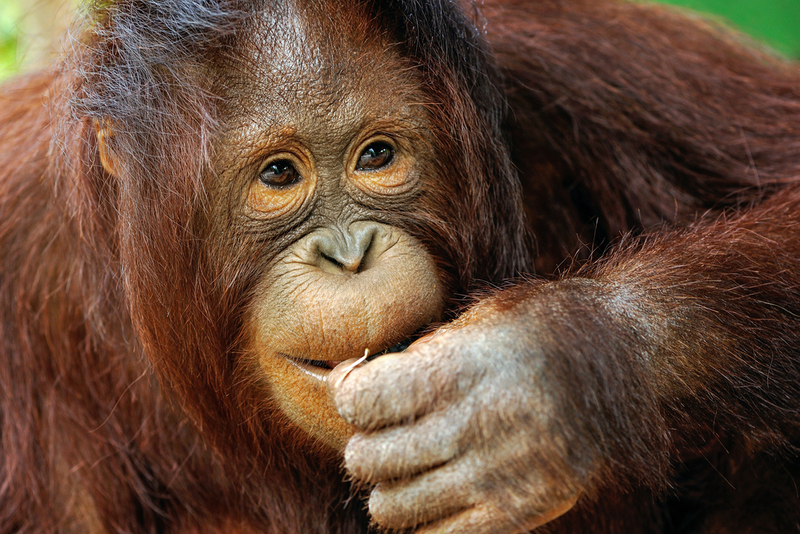 On the other hand (ahem), about 66 percent of orangutans are lefties. Now that we have examples of non-human handedness, the next question is, why do animals take sides? In other words, as Hopkins puts it, “what’s the underlying evolutionary mechanism that’s selective for this?” Researchers are still theorizing. “We’re in no man’s land a little bit,” Hopkins admits. One leading theory for the benefits of handedness in an individual organism stems from its connection to brain asymmetry, and the division of labor between the two halves of the brain. If only one side is enlisted for certain tasks, that “most likely speeds up reaction time,” says Cantalupo. Meanwhile, some researchers think that population-level handedness is beneficial for social species, according to Cantalupo. For example, if all the fish in a group prefer the same direction, it’s easier for them to swim and navigate as a shoal. In the meantime, next time you high-five an orangutan, remember to use your left hand. Nicole Wetsman was Science Friday’s summer 2016 web intern. She has a degree in neuroscience from Bowdoin College in Maine, and she’s now a graduate student in the Science, Health, and Environmental Reporting Program at New York University. Recent evolution has given humans the ability to break down starch and digest cheese. Bon appetit!